I’m currently putting the finishing touches to my second book, which is a follow up to Electric Bass: Improve Your Groove. In the new book, I have a section which is about feeling multiple subdivisions. Meaning, can you play bass grooves that use both straight 8th notes and 16th notes, as well as triplet rhythms? It’s hard to switch between straight rhythms and triplet rhythms without dropping the groove. This video features a bass groove that I wrote for the book. It has a straight 16th note feel, but it also contains triplets. The video features two variations of the same groove. Here is the first, simpler variation. This version of the groove features straight 8th and 16th notes, Ta-Ka and Ta-Ka-Di-Mi. But it also features quarter note or crochet triplets. Quarter note triplets are a rhythm that many people struggle with. But they don’t need to be any more difficult that 8th note triplets. An 8th note triplet is simply a beat subdivided into three, Ta-Ki-Ta. A quarter note triplet is the length of two 8th note triplets. So, if you can feel 8th note triplets, you should be able to play quarter note triplets. Think about it like this. Two beats contain six 8th note triplets. Ta-Ki-Ta, Ta-Ki-Ta. If you play on every other syllable, like this Ta-ki-Ta, ta-Ki-ta, then you are playing quarter note triplets. The second variation of the groove features all of the same subdivisions as the first, but it also contains 16th note triplets. 16th note triplets are easy to understand. They are sometimes difficult to play because they can be very fast, even at moderate tempos. The first thing to understand about 16th note triplets is that they are essentially the same subdivision as 8th note triplets, Ta-Ki-Ta. In order to create 16th note triplets you must first feel the straight 8th notes Ta-Ka. Once you have the straight 8th note feel, you must divide each 8th note into triplets, Ta-Ki-Ta. It’s actually easier to play 16th note triplets on straight grooves like this than it is to play them on triplet feels such as shuffles and swing. The reason is that they are derived from subdividing the straight 8th notes into triplets. This week I’ve been practising playing in odd meters and I want to briefly share my system for playing any unusual time signature. My system revolves around learning and reciting rhythmic phrases rather than counting beats, and if you use it properly it should make playing odd meters no harder than playing in 4/4. he term odd meter simply means any time signature that has an odd number of beats or subdivisions in a bar. Odd meters divide opinion amongst musicians. Some musicians (including me) love them and think they can flow and groove just as well as any groove in 4/4. Others hate playing them. I want to share an approach that I use to playing odd meters. 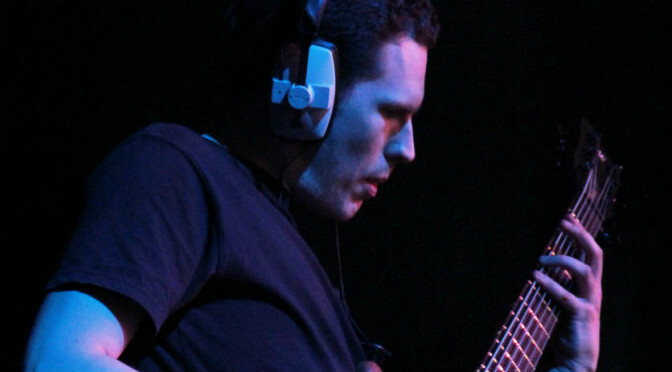 It’s actually not that different to my approach for playing in any meter, but I think that musicians who are not comfortable playing in odd meters often feel that they have to do something different when playing odd meters. And that might be the root cause of why they struggle with them. What do I mean by rhythmic phrases? Every meter or time signature has a fixed number of subdivisions per bar. 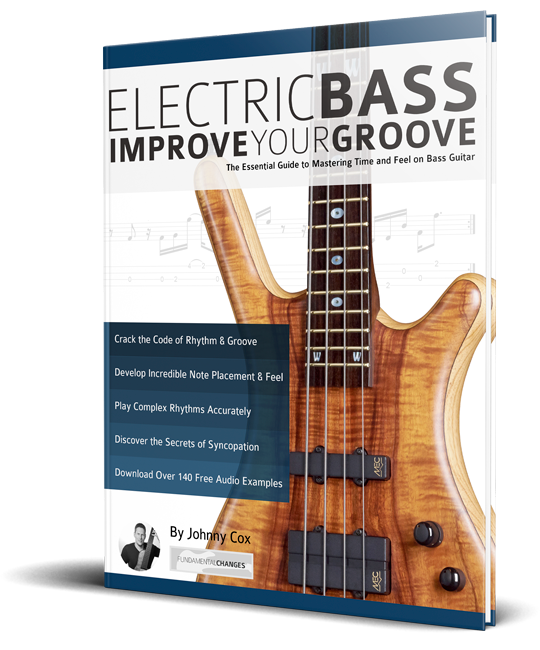 Check out my book Electric Bass: Improve Your Groove if you’d like to learn more about subdivisions and rhythmic structure. The rhythmic structure of a bass groove comes from how you organise these subdivisions. I’ll use the examples from the video to demonstrate. The first one is in a very unusual time signature 15/16. Which means there are fifteen 16th note subdivisions in every bar. In this example I’ve arranged the fifteen subdivisions into three groups of four and one group of three. If you’ve read my book or followed some of my previous videos you’ll know that I like to use Indian Konnakol syllables to recite rhythms. The syllables for a group of four subdivisions are Ta-Ka-Di-Mi and the syllables for a group of three subdivisions are Ta-Ki-Ta. So, the rhythmic phrase for the above example is as follows. It’s actually a very simple rhythmic phrase, even thought the time signature 15/16 might make you think of something very complex. An even more simple arrangement of fifteen subdivisions would be five Ta-Ki-Ta’s. This creates the feel of a 5/4 shuffle. How Can You Apply This System in Any Time Signature? This idea can and should be applied to any groove in any time signature. Including the obvious ones like 4/4. It’s not always easy because there are much more complex rhythmic structures than the examples above. But the key is to understand firstly, what is the subdivision (8th notes, 16th notes, triplets etc.) and secondly how many are there in each bar. Once you know the answer to those two questions you can work out rhythmic structures using basic maths and Konnakol. Here are some more examples I’ve come up with for the purposes of demonstration. The first one is in 3/4. 3/4 is often not thought of as an odd meter because it’s been a fairly common time signature for hundreds of years. It crops up regularly in classical music and jazz as waltzes. But as you can see from my example. It doesn’t have to have a waltz feel. The addition of 16th note subdivisions changes the feel entirely. Here’s another example in 5/4. 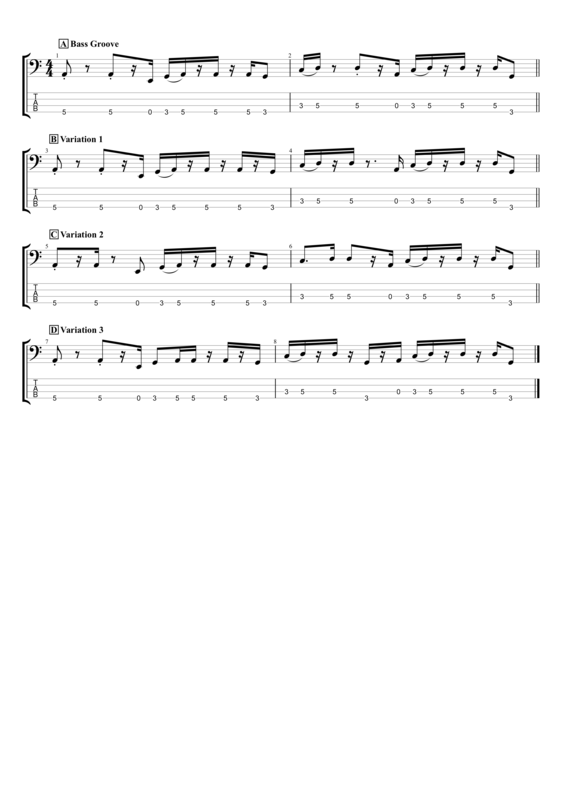 This also has a 16th note feel and the rhythmic structure is slightly more complex than the previous examples. The final example in the video features a more relaxed 8th note feel on a 7/4 time signature. I would suggest practising this in three stages. You don’t need an instrument until the third stage. The first stage is to work out your own rhythmic phrases. Pick a meter that you want to practice and work out rhythmic phrases that contain the correct number of subdivisions. An old fashioned pen and paper might be the best way of doing this. Next, recite the rhythmic structures using Konnakol (or whatever system you prefer). My application of Konnakol involves using Da for one subdivision, Ta-Ka for two, Ta-Ki-Ta for three and Ta-Ka-Di-Mi for four. For more subdivisions you can just combine syllables. For example five could be Ta-Ki-Ta Ta-Ka. Six Could be two Ta-Ki-Ta’s and seven could be Ta-Ka-Di-Mi Ta-Ki-Ta etc. The final stage is playing your rhythmic phrases on your bass! In this week’s video practice diary I’ve been thinking about how to practice rhythmic variations. 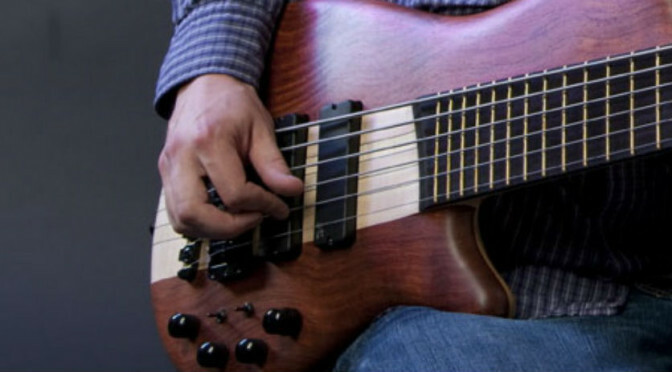 As bass players we often find ourselves playing repetitive grooves with static harmony. You can make those static grooves more interesting by playing subtle rhythmic variations. Here is how I would practice that. We’ve all been in the situation where we’ve played a bass groove for a period of time. And during that period of time we’ve started to feel that it’s getting boring, not just for us but for the audience listening to us. It’s a dilemma, because if you change the groove too much it can affect the band and the performance in ways that might not be appreciated. So the key in that situation is to come up with subtle variations. They may be so subtle that your audience doesn’t consciously notice them, but they will still add to a feeling of movement and flow in the music that will prevent it from becoming boring. How Do You Come Up With Rhythmic Variations? It’s easy to say that the answer is to come up with subtle variations, but it’s harder to achieve it without becoming repetitive. So I’ve come up with this system for coming up with as many potential rhythmic variations as you can. You need to start with a groove. You can come up with one of your own or you can use one that you know. I’ve come up with my own in the video to avoid copyright complications. But I did think about doing the video with a famous bass line to help illustrate the idea. Here is the bass line I’ve used in the video. The next stage of my process was to come up with a rhythmic variation. I restricted myself to only changing the rhythm of two notes. Because I want my variations to be subtle. I’m not trying to change the whole groove. The variations should sound organic and fit in with the original feel. Here is my first variation. The last note of the first bar has been moved one sixteenth note later. And the third note of the second bar has been moved one sixteenth note earlier. If you’re not sure what I mean then check out my lessons on rhythmic subdivisions and eighth and sixteenth note bass grooves. I then came up with two more variations, I allowed myself to add individual notes and move notes by a single subdivision. But not many because I’m still trying to keep the core elements of the groove. Here are variations two and three. Hopefully you can see that this system gives you the potential to come up with a lot of subtle variations for your bass grooves. It even gives you the potential to evolve your grooves into something rhythmically different without ever making an obvious change that an audience would notice. If the music will allow it, you could keep changing the groove in two places each time you play it. 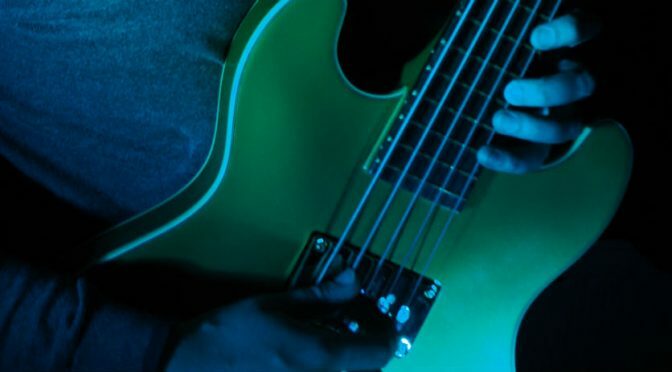 Before long you can build a bass groove that is entirely different without having played an obvious change to the groove. At the bottom of the page I’ve put the bass groove plus the variations. I’ve demonstrated playing it all together in the video. When I played it for my wife, who isn’t a musician, she said it sounded good but she couldn’t tell the difference between the variations. That is exactly what I was trying to achieve. Because the variations exist to make the music sound more interesting without it sounding like I’m changing the groove. An audience will respond positively to rhythmic variation, if it’s done well, but they probably won’t consciously be aware of what it is that sounds good. 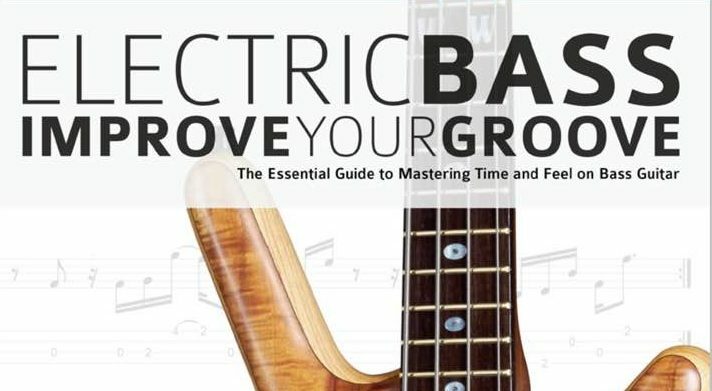 This video post features a piece from my book Electric Bass – Improve Your Groove: The Essential Guide to Mastering Time and Feel on Bass Guitar. The piece is called Straight In Time because it features a straight eighth note feel throughout. Having said that, it isn’t a straight forward groove to play. There are tricky eighth note syncopations to negotiate and a technically challenging section in which you must play on every subdivision. Straight in Time comes with a full track and a backing track with the bass guitar track removed. In the video I’m playing along with the backing track, just like you can if you buy the book.